Timing is everything and you can’t judge a book by its cover. It seems we’re constantly reminded of these lessons. I’ll share some examples this week. First of all, I faced these truisms late last week when I tried to push the garlic season by digging some bulbs for the Saturday market. On the surface they looked huge – stems thick and green. My hopes were high as I gently lifted the first few from the rich, dark soil only to be disappointed that what emerged did not match what was visible from above. Yes, I was pushing the season by two to three weeks, but the stems were already so big I thought… Reminds me of another saying: Good things come to those who wait. Like fine wine, the World’s Best Garlic will not be rushed. The flavour is as good as ever, but more time will fill out the cloves. It won’t be back at the market until next week. Another example of the importance of timing is how global climate scientists managed to manipulate the weather to cause devastating floods in England, southern Norway and India to coincide exactly with the COP 21 climate change talks in Paris. It’s obvious that climate scientists caused the massive rainfalls in England and India because they dumped the same amount – 341 millimeters – in both locations. This is exactly the type of lazy science we have come to expect from the likes of NASA, NOAA, NIWA, and the IPCC. At least we can rely on India’s Prime Minister Narendra Modi, and his press office, for giving it to us straight on the flooding. What most people don’t realize is that Modi made a special trip to Whanganui in June to assess the extent of our own flooding as shown in the accompanying photo. In the age of Photoshop, many things may not be as they appear. But seriously, how’s this for timing: the region of Cumbria, England has experienced three record floods in a decade. After the 2009 flooding, residents were told they had experienced a once in a lifetime rain event. Nek minit, Storm Desmond with over a foot of rain in a day. Water levels were half a metre higher than the 2005 flood. By these measures, Whanganui could experience flooding 50 centimetres higher than this year as soon as 2021. Although there is low probability of this happening, it is not out of the realm of possibility. Cumbria has set a precedent, and even if we stopped burning carbon today there are already decades of extreme weather events loaded into the atmospheric system just waiting for the right time. Throughout Cumbria, 45 million pounds have been spent on flood defences over the last decade. They were all overtopped, although Floods Minister Rory Stewart claims they slowed the water and allowed more time for evacuations to take place. Timing is everything. A simple way to describe pre-silience is a stitch in time saves nine. All this means is that a timely effort now will prevent more work later. For example, a small hole in a shirt can be repaired with one stitch if caught early, but will require many stitches if allowed to tear and grow larger. Personally, I don’t bother repairing shirts because at the present time they are cheap and abundant from op shops, but I do spend hour upon hour stitching up houses and land. That is to say making both more robust and resilient. I’ve always been attracted to old homes and marginalized land. Repairing both is fun and rewarding work. Unfortunately, the concept of resilience has yet to arrive in our community to any significant extent, but I believe its time will come. It’s just discouraging that until then so many unrecoverable resources will be misdirected and monies misspent. I’m told that “a stitch in time saves nine” is an anagram for “this is meant as incentive.” But I’m not so sure. Thought you might like someone like Jordan Esmond to film and promote your hard work and knowledge. 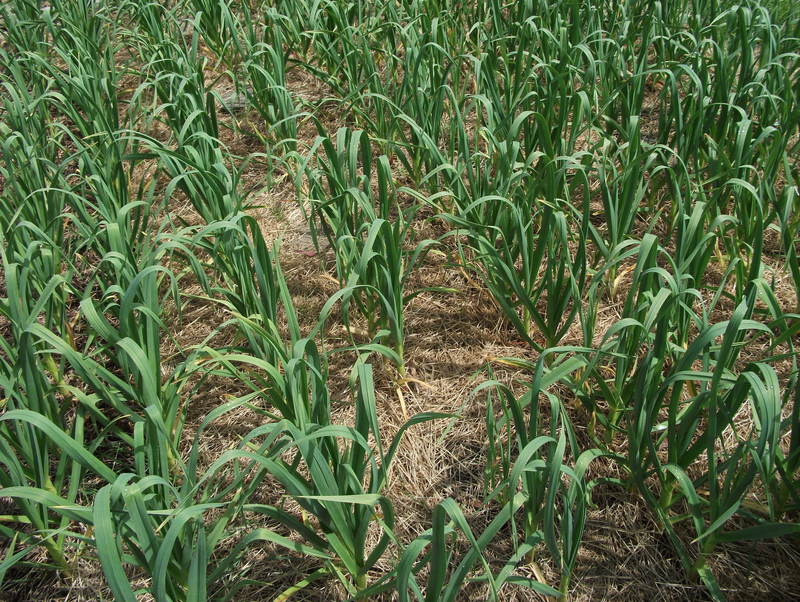 Are you planning on selling some of your amazing garlic for seed? My garlic developed rust 2nd year in a row (bought from rick &liz in Raglan). So like to learn more about your way of growing. I’ll have a look at the FB page, thanks. Yes, we will have seed garlic. I have heard of other people getting rust this year as well. It looks like we will have a great crop this year.